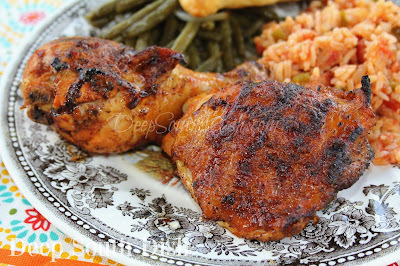 A flavorful grilled chicken, marinated in a bold and zesty blend of oil, citrus, garlic and fiery seasonings. Traditionally served with white rice, shown here with a mild, Spanish rice and skillet fried green beans. Literally translated, polo asado means barbecued or grilled (and sometimes even roasted) chicken, though it appears that it most often refers to chicken that is soaked in a mojo-style marinade and cooked on a grill. It's another one of those roadside/food truck favorites, in the same camp with the vinegar chicken I shared recently. In this case I'm using a homemade mojo marinade in place of a commonly used commercial sour orange product, which not only is next to impossible to find here on the Mississippi coast, but also tends to contain additional sugars and preservatives you may not want. I've made the marinade with fresh citrus zest and juices and some bold seasonings, including, achiote (annato), a brightly hued ingredient typically used in both Latin and Asian recipes. Made from ground annatto seeds, it's bright reddish-orange in color, nutty and sweet in flavor, with a bit of peppery aroma and adds a fabulous color to foods. For ease of prep I just used a Goya product containing it, one you can find all over, however, it can also be omitted if you can't. Chicken thighs and legs seem to be on sale here a lot, so that's what I have on hand in the freezer most often, and what I wrote the recipe for. You can, of course, use any kind of chicken pieces you prefer, including a whole, cut up or spatchcocked chicken, keeping in mind that they all cook differently timewise. Just use your handy dandy Polder thermometer to make sure internal temperature reaches 165 degrees F on the thigh meat. Super easy to make. Zest the citrus - I use a microplane zester - and juice them - I love my citrus press too, and whip up the marinade, throw in some chicken, let it soak for at least 4 hours or up to overnight, grill or bake for yummy, deliciousness! Pollo Asado is often served with plain white rice, but I decided to go with some Spanish rice instead. It's a flavorful, but milder version of the popular Mexican rice, making it a perfect match for this chicken. On the side are some skillet fried green beans with onions. You may also serve the chicken with warmed flour or corn tortillas, green or red salsa or pico de gallo, and offer hot sauce at the table. Refried beans, especially homemade, are another fabulous side dish for this chicken. Here's how to make it. Place chicken into a non-reactive bowl or zipper storage bag. Whisk together all of the remaining ingredients and pour over chicken. Seal and refrigerate at least 4 hours, up to overnight. Grill using your favorite method or use this indirect heat method by preheating with all burners on grill to 400 degrees F. Brush grates with a little cooking oil and sear chicken on both sides, 2 to 3 minutes, then turn half of grill off, and move chicken to cooler part of grill. Continue to cook chicken over indirect heat, turning several times, until fully cooked through, about 30 minutes total or until internal temperature in thickest part reaches 165 degrees F on an instant read thermometer. Total time will depend on size and type of pieces. Cook's Notes: Sazon with coriander and annatto is a common all-purpose seasoning used in Hispanic cooking and gives a beautiful color to dishes. You can find it in most big box and grocery stores, however it does usually contain MSG in addition to salt, dehydrated garlic, cumin, coriander and annatto. Make a homemade substitute if you prefer, or simply omit. 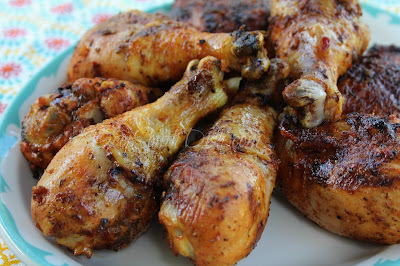 Grilling over direct heat will cook faster, though it tends to dry the chicken out and char the skin as well. Keep an eye on it. Mexican oregano is more robust and less sweet than traditional Mediterranean style, but either will work. Variation: If you'd got great access to chilies, certainly substitute for the chili powder. Use a rehydrated ancho chile, stemmed, seeded and rinsed, a chipotle chile in adobo, or your favorite chile, finely minced or pureed. To Bake: Preheat oven to 375 degrees F. Place chicken in a single layer into a baking dish. Bake uncovered for 45 minutes to 1 hour, or until an instant read thermometer inserted into the thickest part of the thigh, reads 165 degrees F. Total time will depend on size and type of pieces. 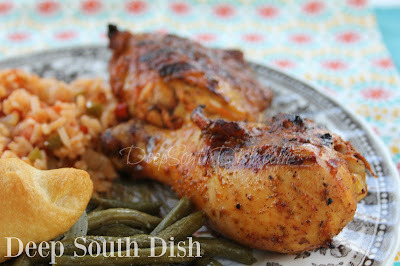 Check These Other Chicken Recipes Out Too Y’all! 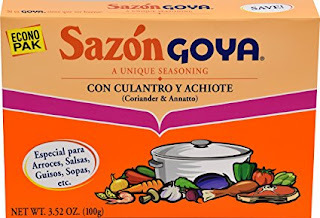 Have both achiote and ground annato in the spice cupboard, so thank you for listing what is in the Sazon product. MSG gives me migraines, don't want that! Can't wait to try this. Aldi's put whole chickens one sale at an insane price, 59c/lb. !! and their avocados, 39c. ((singing)) "how are things in Guacamole?...." Wow, those were some good bargains!